The Guildive, Castine, Maine. Photo Gayle Potter. 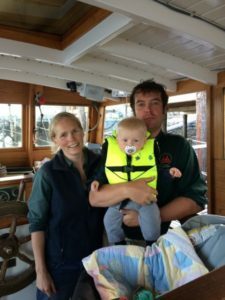 Kate, Zander and first mate on the Guildive, Castine, Maine. Photo Gayle Potter. ably commanded as a day cruiser by a young husband and wife team of captains, Zander and Kate, and their six month old son getting his sea legs. 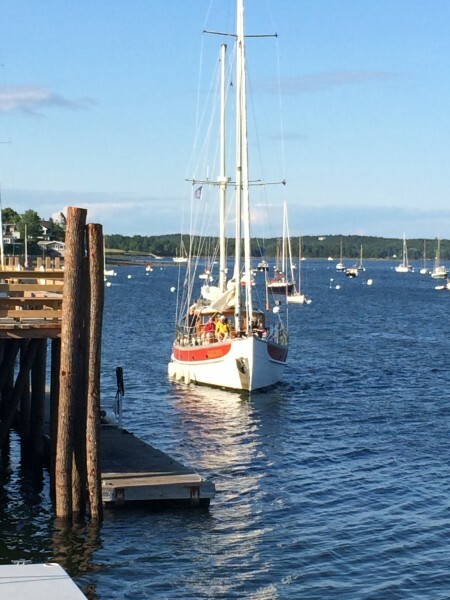 It was getting to sunset, which takes its sweet time in June along the coast of Maine, leaving time for a beer, talk of maritime Maine and of the peculiar history of Castine, where a Revolutionary War naval battle was famously lost by the Americans. It was last summer, and my wife Gayle and I decided to return to the coast of Maine, where we had honeymooned 16 years earlier. It wasn’t so much nostalgia as a chance to freshly explore, to see what had changed, to see what we had missed, and frankly, because our daughter was off at summer camp for the first time and we felt freshly sprung. It was a chance to reacquaint ourselves with a concept we had nearly forgotten: serendipity. That is the golden word for a few aimless days along the coast of Maine. That sign pointing to a road down a long peninsula to Pemaquid Lighthouse? Take it. The realization that we needed to stop in the visually engaging town of Damariscotta? A gift. A cruise on the Guildive? Why not? It was a long overdue return, and we moseyed up from Portland, with a near obligatory stop at L.L. Bean in Freeport to each grab a high tech garment to handle the forecast for cooler than normal coastal temperatures. The last week of June can be blissful but even in a state with a rather short summer, it’s still not quite high season here. While we booked hotels ahead of time, there were still vacant rooms at the inns we stayed at. 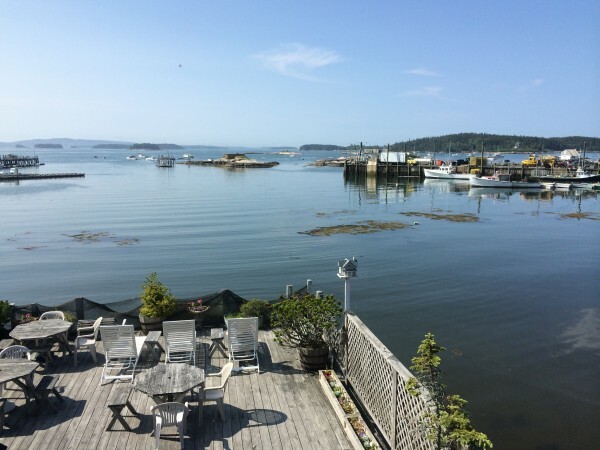 Late June is a sweet spot in Maine, too early for families, yet typically offering clear, blue sky weather, uncrowded restaurants and roads unclogged by tourists hell bent on lobster and lighthouses. Day one set the pattern. We spent the night in Rockland at the Captain Lindsey House Inn, a fine old bed & breakfast on Route One, with a glimpse of the town’s working harbor from our room. Dinner at the hipster haven of 3Crow was wonderful – great pork tacos and a mighty Maine microbrew selection — as was a chance to visit the Farnsworth Art Museum the next day. 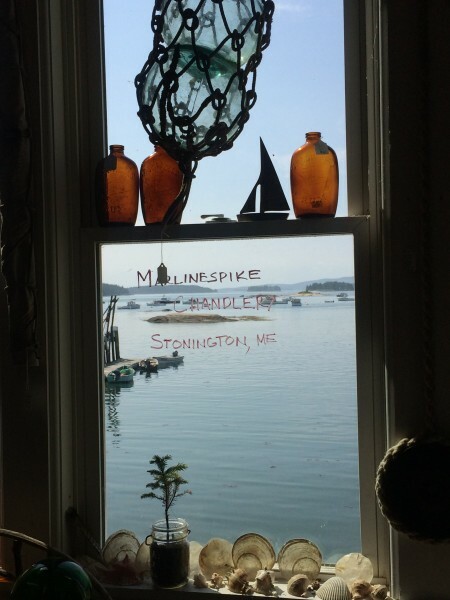 Here we saw works by Winslow Homer and Fitz Henry Lane and all three generations of Wyeths, a finely honed museum that baptizes you in several centuries of the Maine coast. The next day we meandered up that coast, poked around Camden, a picture perfect sailing town that could serve as near constant inspiration for the preppy minds at Vineyard Vines. Then it was time to see a bit of a reborn Belfast, where chicken processing facilities, never much of a magnet for tourism, have yielded to bookshops and bohemia, a place of cafes, warm brick architecture and a quirky energy. Then we drove down the long and winding finger of wooded land to Castine, one of my favorite towns on the Maine coast. It’s a stage set of white clapboard Greek Revival houses from the turn of the 19th century, thriving perennial gardens and a mere handful of shops and restaurants. It seemed and has always seemed just a little too quiet down here: ghostly, beautiful, the houses white and silent in the strong light, too far from everywhere to be corrupted. It’s Brahmins on the beach, or more precisely wrapped up in an old Bean sweater on the rocks, possibly with something on the rocks in hand. Castine was where the poet Robert Lowell summered. So did the writer Mary McCarthy. 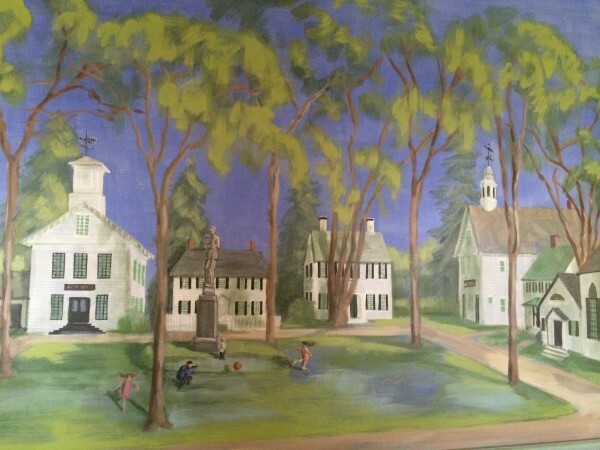 Mural of Castine. Photo Gayle Potter. 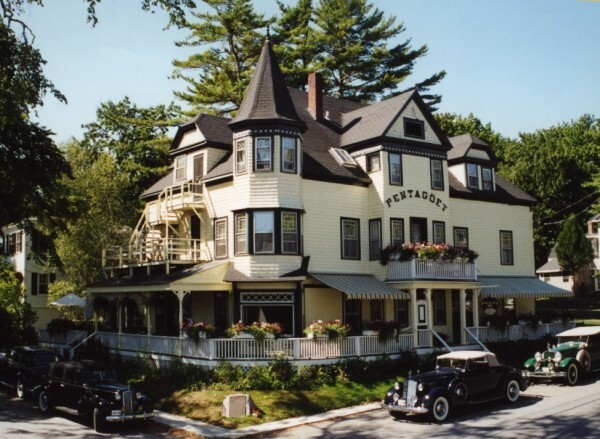 We borrowed fat tired bikes and explored the Thornton Wilder stage set of a town and stayed at The Pentagoet Inn, the Maine inn in your mind’s eye. A late 19th century building with a wide and inviting porch, it has creaky staircases and narrow hallways hung with pictures of sailing ships and rooms reminiscent of your grandmother’s house, had your grandmother been a proper Yankee with a penchant for inn keeping. The surprise was the owner, Jack Burke, with a graying beard and ponytail and vest. He had the very demeanor of a retired pirate, albeit a highly literate one. Think of Captain Jack Sparrow in life’s second act. In fact, Jack is something of that, a retired Foreign Service professional with some colorful tales of his earlier life. Amidst the wicker furniture and a jazz combo and morning pancakes and screen doors, there’s also a bar, Passport Pub, a remarkably dark and inviting hotel bar that perhaps belongs in coastal Britain. 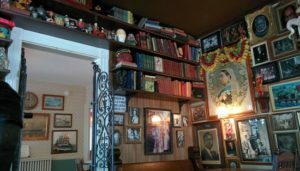 Its walls are covered with Jack’s eccentric collection of paintings of famous world leaders and dictators, picked up along the way at his postings in Africa and Asia. Inn on the Harbor, post-fog. Stonington, Maine. Photo Gayle Potter. 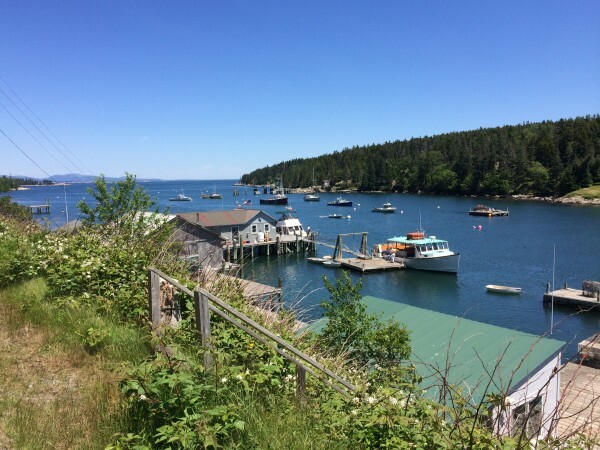 We ambled along the back roads of Deer Isle, where crab rolls and lobster rolls and local ice cream vied for our attention, and eventually came to the lobster town of Stonington. It offers a vintage Opera House, a great cafe in 44 North, nautical flotsam and jetsam at Marlinspike Chandlery, and good local fish at Fisherman’s Friend and the Harbor Cafe. We stayed at Inn on the Harbor, which makes up for its simple style with its nautical location, as it seems to hover directly over the harbor, partly cloaked by the fog that often sweeps in. Somewhere out there in the gloaming lay many islands, including Isle au Haut, the remotest part of Acadia National Park, where I had dragged my bride by mail boat on our honeymoon for a 14 mile hike. It must have sealed the deal because there we were, back again, 16 years later. Shortly before driving away, Mother Nature parted the fog and granted us a brief glimpse of the island, a scene Melville would have found too cheesy. 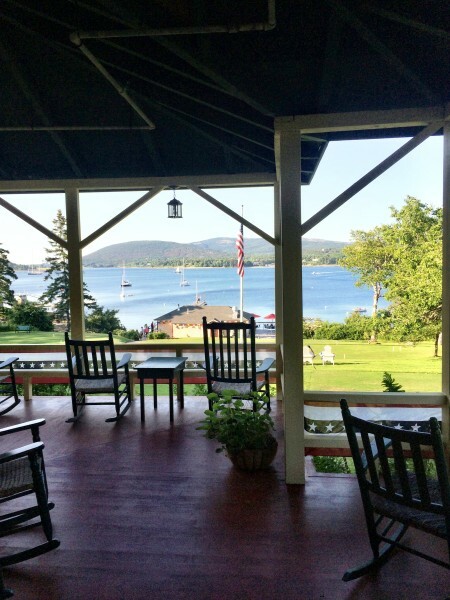 View from the front porch of The Claremont, Southwest Harbor, Maine. Photo Gayle Potter. 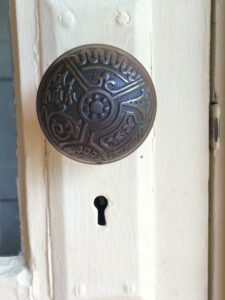 Doorknob, The Claremont. Photo Gayle Potter. We drove through Bar Harbor, busy but not yet gridlocked for high season, so we could park and have lunch on the harbor and stroll past some fine houses. But we slept in the much quieter Southwest Harbor a few miles away, in an attic room complete with claw foot bathtub in The Claremont, which commands a painter’s view of Soames Sound. This hotel is about fireplaces with a healthy blaze day and night, broad lawns with Adirondack chairs and a never-harried bow-tied manager. It is where somewhat befuddled urban guests command easy chairs with fat tomes or slip uncertainly into a porch rocker and try to let the Maine air get the city out of their systems the best it can. We walked to dinner in town at the remarkably good Sips, friendly and filled with locals and with imaginative takes on seafood. The day had been pretty much perfection, so we did the same thing the following day and night. I believe it’s called a vacation. Glorious day for a boat ride along the Maine coast. Photo Gayle Potter. Our last day we dedicated to the water, leaving Bass Harbor on a small Island Cruises sightseeing boat out to Frenchboro, one of the remoter of Main’s inhabited islands,. The three and a half hour tour showed off the best of the coast, from islets covered with harbor seals to sightings of guillemots, cormorants, porpoise and a bald eagle. 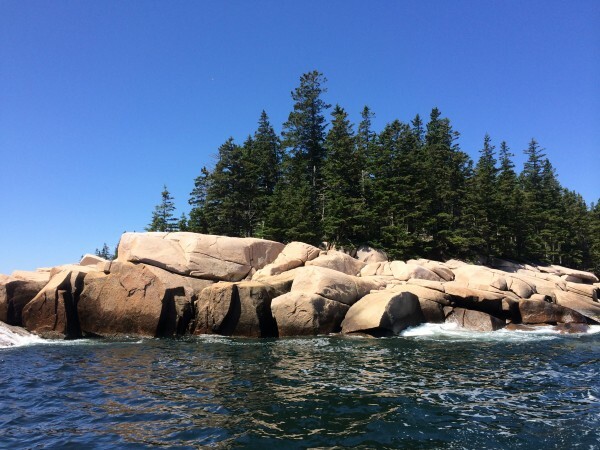 We spied the remains of 19th century granite quarries on Blacks Island and the windows of a house near Bass Harbor where Julia Child had patiently sat and corrected the proofs of Mastering the Art of French Cooking. 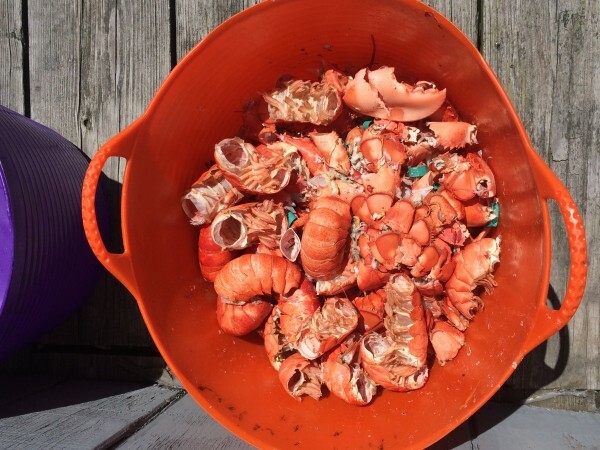 We landed at Frenchboro, which felt less like Maine than one of the remoter shores of the Canadian Maritimes: wild, very isolated, ruggedly beautiful, with a handful of weathered fisherman’s houses and a school. That might change a little this summer, when a small wilderness campground opens here. But it’s doubtful since this is a fierce little island that’s the preserve of the locals, not day trippers. But it was our evening sail on the Guildive in Castine that keeps coming back to me, and the easy conversation with the married skippers about all things Maine and all matters coastal. 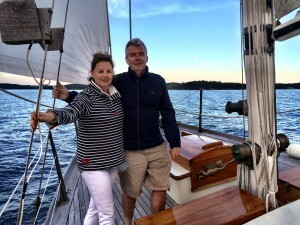 We were the sole guests – another benefit of June travel — and it was a chance to connect to people who call the coast home – and for Gayle to happily relieve Kate of her baby while she did a nautical chore for a moment. Kate and Zander are fresh faced and enthusiastic and stewards for an older way of life. A sail with them was the opposite of mass tourism, and it’s why Maine remains one of my favorite places to slow down and let serendipity be our guide. For more information, go to Visit Maine. 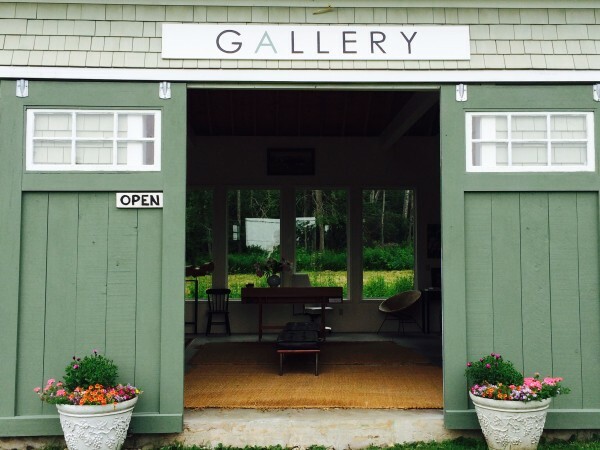 Gallery in Castine. Photo Gayle Potter. On the dock in Frenchboro. Photo by Gayle Potter. Thanks for sharing your serendipity. Loved your pictures Gayle! Completely understand your ties beyond family to Maine. We appreciate our brief experience in Camden for Jillian to study with Alice Chalifoux two summers and the time we spent with you, Leigh and Rick. All to be cherished. Bill has the experience of driving 2000+ miles to deliver and retrieve a harp, both summers, and listening to The Iliad and The Odyssey. Hope Emma had a great time at camp. Thanks Nancy, we have great memories of your visit! Sounds like a lovely jaunt, Everett–written stylishly, and with great charm and humor. Nice photos, too, Gayle. Glad you two got out for a little r-and r. Now, when are you coming up to my neck of The Maine woods? Spring has finally sprung! Thanks Monique. Maybe sometime at the end of next month, just in time for the black flies! What a lovely trip in my home State, thank you for sharing! I’d also suggest a stop in Bath. It’s a beautiful shipbuilding town with an amazing kitchen shop, great antique stores, small restaurants and cafes. Maine Maritime Museum is definitely worth a stop and you’ll find the best beaches in Maine just 15 minutes drive from downtown. How achingly wonderful: anyone’s favorite things wrapped up in a Maine getaway. Your storybook trip was delightfully written and beautifully illustrated with great photos. Take me along! 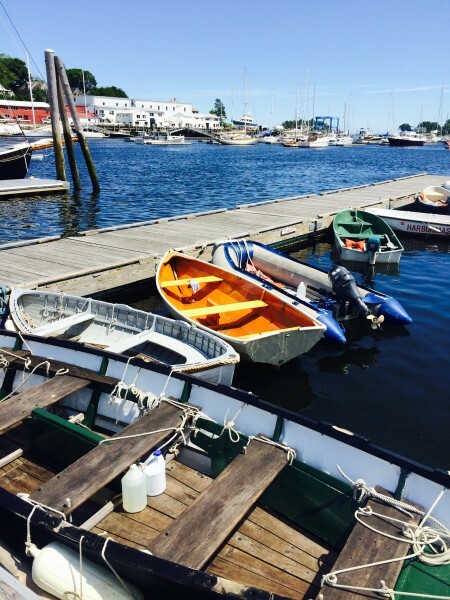 Wonderful meandering around Maine- makes me want to get up from my desk in Maine and get out! Hard to do when you’re already in paradise!